Vast numbers of business professionals are now facing the anxiety of a deeply uncertain future, as automation, digital transformation, and competitive disruptions recast the global economy. While business journals are devoted to discussing corporate strategies to survive the revolution, much less attention is paid to how to equip this army of disrupted employees with the mental and self-esteem tools to survive in their careers, and to preserve their performance for businesses through this period of vulnerability. This, as surveys already show staff engagement at just 32 percent in the U.S., and far lower, on average, globally. Emmy-nominated South African-born filmmaker Caroline Rowland, founder of the UK-based New Moon agency, is the ultimate biographer of competitive success, having deployed her documentary films to help a dozen cities and countries win global sporting events, including the 2012 Olympic Games for London. The recipient of the Distinguished Rhodian Award by her alma mater, Rhodes University, in 2016, Rowland was the 2013 South African Women in Business award winner, and has been twice nominated for Britain’s Entrepreneur of the Year title. However, having produced hundreds of interviews with Olympic athletes and global brand leaders, Rowland told SABLE that she was struck – even astonished – by how many high performing individuals say they were mentally ill-equipped to deal with uncertain futures, even at the height of their success. She realized what a growing number of CEOs are now worried about: that while we all know that we should, for instance, be active, eat nutritious food and avoid smoking to remain physically healthy, most professionals have no idea what habits and tools to leverage to remain mentally resilient to drastic change, at a time when this knowledge is most important. For Rowland, this challenge could presage nothing less than a wholesale pivot for Corporate Social Responsibility programs from purely external to a mix of external and internal. As a result, Rowland is pioneering a new, TED Talks-like business solution to address the coming wave of corporate need for emotional resilience in its workforce – as well as a critically needed open-access platform for the public. Now seeking investment partners and angel funding, “Story Vault” will be a unique anthology of video interviews which explore the relationship between high performance and positive mental health, revealing the personal strategies that business and athletic champions employ for heightened mental fitness. Rowland says Story Vault will be built on three platforms: a licensed product for corporates, and training and engagement programs, featuring high profile achievers; a no-fee, TED-style public platform; and an access-limited research platform for academic partners. “In the corporate environment, the interviews will primarily be with recognizable and revered faces – with content delivering against very specific objectives defined by corporates,” says Rowland. “They can be used within organizations for training, for employee engagement, for management esteem, for help in managing exits or changing skill sets – but with the priority being all about developing a really sensible and practical approach to critical thinking and to problem-solving. Giving Rowland a running start, as well as direct inspiration, in the innovative venture is that existing content from New Moon – including exclusive interviews with iconic global stars – will be available to Story Vault. The business plan calls for 52 high profile interview releases in the first year for the corporate platform – becoming a week deliverable for license holders – as well as 52 stories for the public platform. To help understand the impact of these new pressures, Rowland has commissioned preliminary research on employee insecurity, and how it is impacting their performance, and corporate performance overall. Already, Rowland says both executives and health professionals indicate concern that this fear can trigger or deepen illnesses like depression and stress disorders. She says she has found both shocking evidence of the problem and effective personalized solutions in her vast archive of candid interviews with elite athletes, entertainers and entrepreneurs. Since she founded New Moon in 1996, her story-telling agency has helped more than a dozen cities promote or secure major sporting events, including the 2020 Youth Olympic Games for Lausanne, and the 2022 FIFA World Cup for Qatar, and the 2014 Winter Olympics for Sochi. In the world of business, Rowland’s vivid campaigns have helped secure the Unilever and BBC audit contracts for KPMG, and helped Dubai win the rights to host the World Expo. However, she rose to global prominence with her direction of the official film for the London 2012 Olympic bid, which “won London the Games,” according to the city’s mayor. Perhaps more important: it also inspired the UNICEF “International Inspiration” program, to channel 12 million children in 20 countries out of poverty though sport. 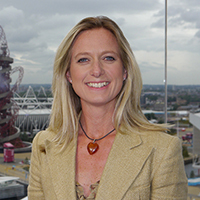 Her documentary feature ‘FIRST’ – which chronicled the stories of 12 first-time Olympians at the London 2012 Games – was later nominated for an Emmy. Now, Rowland says she is energized by the challenge of pivoting to mental health as both a viable business innovation, and a public service. She has already established twin homes in London and Los Angeles for the proof-of-concept phase. And while other NGO and media platforms focus on mental illness and the tragic drama often associated, she stresses that Story Vault will focus on the “health” part of mental health. She adds: “I think there is a danger right now of mental illness becoming glamorized by so many celebrities and high-profile people coming forward saying, "I've had a mental illness." In contrast, one her recent interviews features a six-time Olympic medalist who tells Rowland about suicidal thoughts she had while literally standing on the medal podium – due to the lack of preparation she had for a life beyond competitive success. However, the story focusses, instead, on the athlete’s successful strategy for emotional resilience and goal-setting afterwards. For Rowland, the interview format is key. “I think, we have, as a human race, kind of suppressed our desire and ability to tell stories, in a rich and beneficial way to others – this needs to be reignited,” she says. “In hearing other people's stories, we find a genuine solace; we find inspiration; we find connection. It's what I did with New Moon for 20 years. And I think it could be very effective in helping to solve a growing global issue.